Photograph, Picture of the exterior of Anderson Fair Retail Restaurant. Image available on the Internet and included in accordance with Title 17 U.S.C. Section 107. 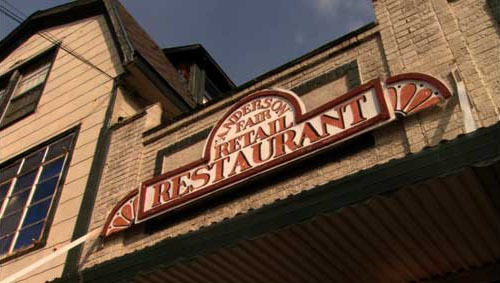 ANDERSON FAIR RETAIL RESTAURANT. Anderson Fair Retail Restaurant, located on Grant Street in the Montrose section of Houston, opened by January 1970 as a folk and original music venue and was founded by businessmen Marvin Anderson and Gray Fair. Though the management and ownership have gone through many changes, the establishment was still in operation in the 2010s with virtually the same physical layout and music format as the day it opened. The small main room seats about eighty and has been commended for its good acoustics. Not much PA equipment is needed to fill the room. Memorable performances there have included Townes Van Zandt, Richard Dobson, Vince Bell, Lucinda Williams, Steven Fromholz, Eric Taylor, Don Sanders, the Hemma-Ridge Mountain Boys, Bill and Bonnie Hearne, Lyle Lovett, John Vandiver, Katy Moffatt, Butch Hancock, Shake Russell, Dana Cooper, Dan Hicks, and others. Photograph, Picture of band playing on the stage at Anderson Fair Retail Restaurant. Image available on the Internet and included in accordance with Title 17 U.S.C. Section 107. The "AFair" serves good "down-home cookin'," maintains a reading room, and has a courtyard for those who want to discuss any topic known to man. The business is unique in that it operates completely with volunteer staff. Performers meet and talk backstage while waiting their turn. Anderson Fair has also contributed to some festive block parties, because it is on a short street from which traffic is easily excluded. With the side street blocked, the venue has provided an ideal setting for the street parties at which the bands have often performed on a flatbed truck—all day and often into the night. Release parties for several Buttermilk Records artists—Richard Dobson, Fevertree, the Hemma-Ridge Mountain Boys, and Bruce McElheny—have taken place at Anderson Fair. In the 1970s, at the invitation of owners Walter Spinks, Roger Ruffcorn, and Tim Leatherwood, Buttermilk made recordings that included Lucinda Williams, Eric Taylor, Don Sanders, and Linda Lowe at Anderson Fair. Picture of Anderson Fair Restaurant. Image available on the Internet and included in accordance with Title 17 U.S.C. Section 107. Small changes over the years have included construction of a new stage, built by resident songwriters Ken Gaines and Wayne Wilkerson who host the songwriters' night on Thursdays. A recording studio has been added in the retail space adjoining the club which does independent projects but can also record live shows from the stage. Tim Leatherwood was still in charge in the 2010s, and audiences could still hear a variety of acoustic music in a non-smoking, serious-listening environment. Patrons who talk during performances or allow a cell phone to ring will get their cover charge back and be asked to leave. Beginning in 2007 Ghost Ranch Films of Houston (with producers Bruce Bryant and Jim Barham) worked on a documentary film about the venue—For the Sake of the Song: The Story of Anderson Fair. The film made its world premiere at South by Southwest in 2010 and received critical acclaim at screenings at various independent film festivals. Anderson Fair (http://andersonfair.net), accessed September 7, 2015. Houston Chronicle, April 15, 2007. Handbook of Texas Online, Charles Bickley, "ANDERSON FAIR RETAIL RESTAURANT," accessed April 21, 2019, http://www.tshaonline.org/handbook/online/articles/xda02.